At the same time that the Alalusi Foundation supported audiology clinic was treating nearly 200 children with hearing loss regain some or all their ability to hear, a two-day workshop was being held for the benefit of local social workers, psychologists and educators to better understand the need for and benefits of using art as a therapeutic tool for those who have suffered from trauma. 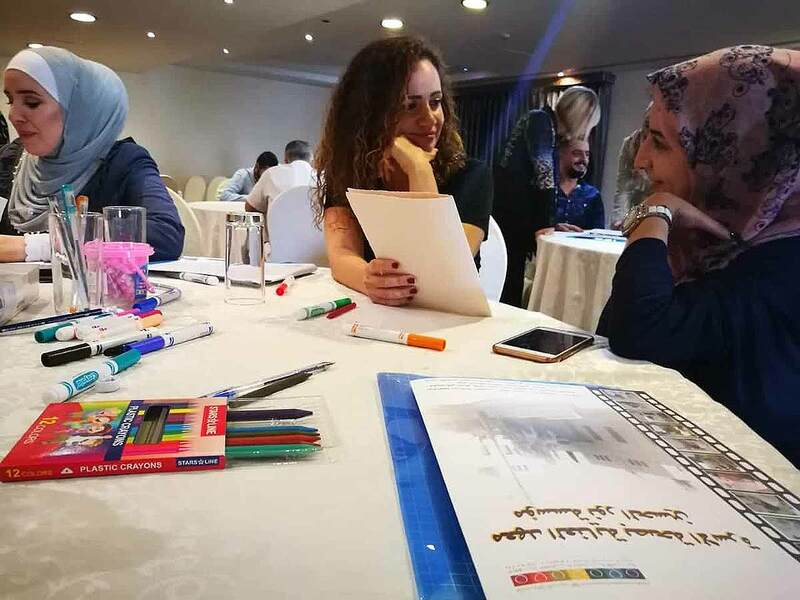 The primary focus of the workshops were for individuals involved to experience the process so that they can better understand that creating a therapeutic sanctuary for each child and adult traumatized by war is imperative. With the common tools that are taught, it isn't necessarily easy to understand how therapy with art as a tool is vital. In trauma treatment, it is not the verbal account of the event that is important, but the non-verbal memory - the fragmented sensory and emotional elements - of the experience that are significant. In order to treat trauma effectively, especially in children, therapists must move beyond words and language and integrate the trauma. Art allows the trauma come out at the speed the patient is more comfortable with and often shows itself without the patient knowing. 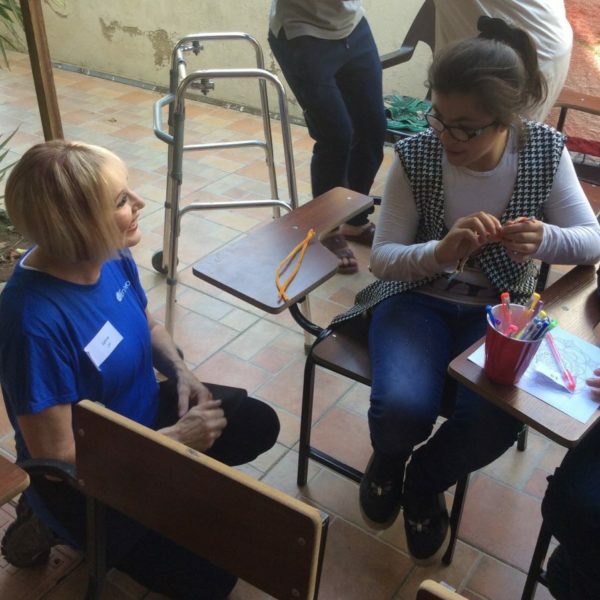 Below is an interview conducted by the Alalusi Foundation with Lynne Whitlock in Amman, Jordan. Lynne: My name is Lynne Whitlock and I am a Marriage Family psychotherapist as well as an art psychotherapist. I have been in practice since 1982. I’ve primarily worked with trauma victims for the greater part of those years. I worked with Vietnam veterans; burn victims; victims of crime, domestic violence and child abuse. 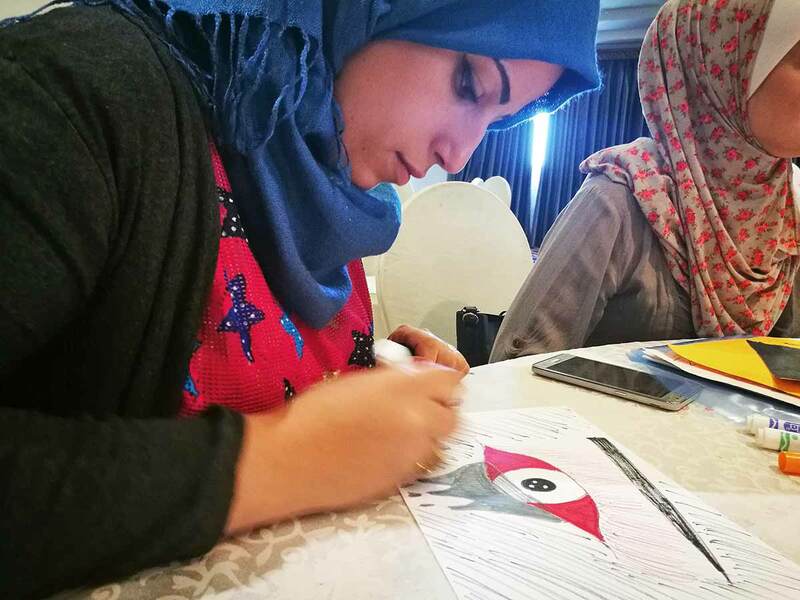 Alalusi Foundation (AF): How did you first become involved in art therapy? Lynne: I began utilizing art therapy when I worked with troubled children in the school systems. It became very apparent that children often struggle to articulate their experiences. Art therapy provides an indirect and safe means to outlet feelings, communicate traumatic memories and to hopefully integrate their painful events. AF: How does art therapy work? Lynne: Trauma can be locked deeply in the unconscious. Often trauma victims simply cannot recount historically what has happened to them. It may only show itself through “somatic symptoms” (physical ailments) anxiety, depression and reactivity to name a few. Because the traumatic events can be so deeply locked within the victim, they are not able to speak to the issue. Through the use of art media, which can be paint, sculpture, drawing or any form of free art expression it can improve one’s overall well being. Trauma informed art therapy can become a safe sanctuary to reduce symptoms. Sometimes trauma victims are not even aware that what they are expressing through art may be relative to the trauma. It gives them the opportunity to release it and hopefully reconcile the emotional conflict. AF: Do you only work with children or do you also work with adults. Lynne: I've worked with both children, adolescents and adults. Art therapy works well with any age. My experience has been that adults are more reticent when it comes to doing art therapy. The resistance may be that they feel that they are not “good enough” artists or that it may be “child’s play.” However with a little psycho-education regarding the benefits of art therapy and allowing individual’s to experience the process, adults often find that art therapy is a powerful tool towards the reduction of symptoms. AF: What kind of environment do you work in? Lynne: The last few years I've mainly worked with children that were adopted and have Reactive Attachment Disorder. These children were removed from their biological parents for many reasons; neglect, abuse, homelessness etc. and placed in foster homes. Many have suffered from having been placed over and over in different foster homes. Some of these children have endured trauma after trauma and are not able to speak to what has happened to them. The thing is with these kids, they are reactive, they are withdrawn, they suffer from attachment disorder and they may have sensory issues. In other words they are experiencing the results of trauma. So what art therapy does is give them an opportunity to calm themselves. It can be very self-soothing as well as being able to express the inner most part of their unconscious with regards to any kind of trauma. Some of these children are grieving the loss of their loved ones. It gives them an ability to be able to grieve this loss in a safe environment. AF: What is the process you use to do therapy with art? Lynne: The first thing I do when a child or adult walks into my office is begin to build rapport and help them feel secure and safe. It may take several weeks but building the trust is significant in therapy. I may have the client draw a family kinetic drawing. “Draw your family doing something together.” This is a diagnostic tool. What this provides is an understanding of the family system. They might draw images of their immediate family or extended family. The interesting part about this is that the art therapist gains insight as to who is important in the individual’s life. Where is the client in the picture? Is the client even in the picture? Who's the biggest one in the picture? This often shows the power structure of the family. Sometimes a child will be in the background and may not have any eyes or mouth, which can mean they have no voice in the family. So that's one of the first things I do. I may simply have the client do a scribble drawing or free expression painting to help with relaxation. Another diagnostic tool I might use is called the house-tree-person diagnostic test. This test represents how the child or adult perceives themselves. Is the tree rooted? This may provide information as to whether the client feels grounded. What do the limbs look like? Are they able to stretch and grow? Or is the tree a stump which may correspond to feeling thwarted in what's going on in their life. The house represents themselves. Are there any windows in the house? If not, it can equate to the client having trouble expressing themselves or emotionally withholding. Is there a door knob? Sometimes if they don't put a doorknob on the house it can also be indicative of blocked trauma. HTP (House Tree Person) is representative of the child or adult’s inner world. Sometimes the child will say, "Oh! I forgot the door knob." Client’s will do that. But if you see a consistent pattern in their artwork that shows them cut off, then the clinician may explore further the deeper level of trauma and assist in finding ways to express the traumatic events through the language of art. As I previously said, if the child is drawing themselves without any eyes, without any arms, that's fairly suggestive of feeling helpless. That gives me an opportunity then to explore further through the process of having them just do any drawing that they want. After a period of time they will speak to the issue of what's missing, who is important in their life, and very often over a long period of time they will speak to the trauma through the safe means of art. AF: Is art therapy then just the first tool in the process? Lynne: It can be. Art therapy is pivotal because when you're talking about deeper trauma, it is the one safe thing that we recognize can work effectively with trauma. Expressive therapies such as dance, music drama etc are also compelling means to work through trauma. If a child or adult is excessively isolated and withdrawn, simply giving them crayons and a piece of paper allows for free expression and can be a non-threatening means to channel suffering. AF: What is the perception of art therapy and how is it different from that perception? Lynne: I believe there are many that feel that art therapy is just for fun. I think it's very important that we educate parents, professionals and the clients themselves on the importance of art therapy. When words fail, art therapy can be a vehicle for healthy change and for the integration of trauma. Because it's somewhat misunderstood and is not just play and coloring, it is our responsibility as clinicians to demystify art therapy. We can assure those involved in the process that it can be a holistic treatment for mind, body and repressed feelings. AF: How did your professional training prepare you for the real world experience of practicing therapy through art? Lynne: When I started doing the training in art therapy, I realized that there are many avenues in art therapy. In addition to employing art media, I have often used sand tray therapy with trauma victims. Sand tray therapy is another nonverbal therapy that allows client’s to reconstruct their world using miniature characters in the sand, and thus working towards resolving ongoing conflict. Available is a tray filled with sand. There are many, many objects, people and animals that the client can use to act out what is happening in their life through these characters. In working in child abuse, children often place parental figures in the sand and act out the abuse. The often result is that the children gain control over their environment. I had one child that witnessed a very severe trauma in his life. His father shot his mother and then his father set the house on fire. I worked with this child for over a year never discussing specifics of the trauma he witnessed. He acted it out in the sand tray. And he was able to reconcile the horrors he witnessed. AF: In the context of Syrian refugees living in Jordan, how would you go about helping them to heal? Lynne: I think it's a similar formula except it takes longer for psychological mending. The longer a child has been dealing with trauma, the longer the process of emotional repair. Some of these children were born into war and have known trauma their whole lives. If we can get these kids into therapy sooner, the better the long term outcome. The longer we delay therapy, the more difficult it is to heal the trauma. And the thing is, that with asylum seekers it can be a family hardship just to get into therapy. As a therapist I must create a therapeutic sanctuary and security, become an ally and build continuity. I must also keep in mind the issues of displacement and dislocation and cultural differences of the host country. The challenge for psychotherapists is regulating the sensory imprints associated with trauma which may have gone on for years. Refugees can experience a lack of control as if involuntarily reliving trauma. A goal is to help unravel the complexity of their trauma so that they're able to function without acute stress symptoms, without anxiety, without somatic symptoms, without acting out and being reactive. 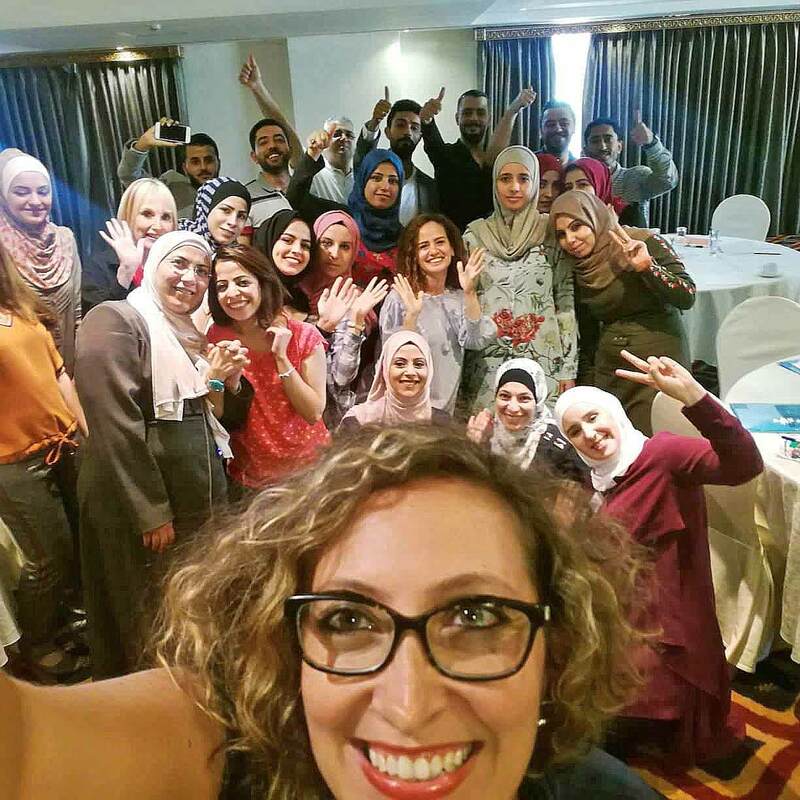 AF: In Jordan, you were one of the organizers of a conference on the use of art therapy. Can you tell us a little bit about that? Lynne: Yes. I am very pleased to say that I was sponsored to do this conference through the Alalusi Foundation. The conference was created for local social workers, educators and therapists. What we're hoping to do is build collaboratively with local agencies to enhance mental health interventions to benefit refugees and displaced families and children. We were able to work with the Queen Noor Hussein Foundation and Kaynouna Art Therapy Center. The goal of that conference was to collaborate as well as to find out what and how we can augment what is already being done in Jordan. One of the things that I really enjoyed and found very beneficial was to have clinicians experience what children may experience in the art therapy process. The idea was to have the professionals vicariously live through what the children are living through. For example, I asked the clinicians to draw something that they see as a problem. We discussed what the experience was like and deliberated on whether they personally found the process constructive. Many of the professionals were able to experience the benefits of trauma informed art therapy.